Boulder County Sheriff utilizes an emergency notification system that allows residents of the county and all cities within to be notified of emergency situations. Notifications can be received in a variety of ways, including cell, home and work phones, and by text messaging and/or email. You can sign up for alerts and manage your profile at the Everbridge Emergency Alert Program site. If you need alerts about activity at more than one location within Boulder County, fill out a separate registration form for each address. …in the City of Boulder, please contact Ted McEldowney of City of Boulder Police Department at mceldowneye@bouldercolorado.gov. …the City of Longmont, please contact Ken Nichols of Longmont Emergency Communications at Kenneth.nichols@longmontcolorado.gov. 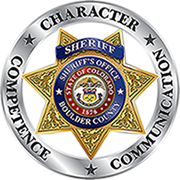 …anywhere else within Boulder County (outside of the cities of Boulder and Longmont), please contact Mike Radden of Boulder County Sheriff’s Office Communications at mradden@bouldercounty.org.